I've been promising a tutorial for my Saguaro Quilt for quite some time, and today I'm finally going to deliver! 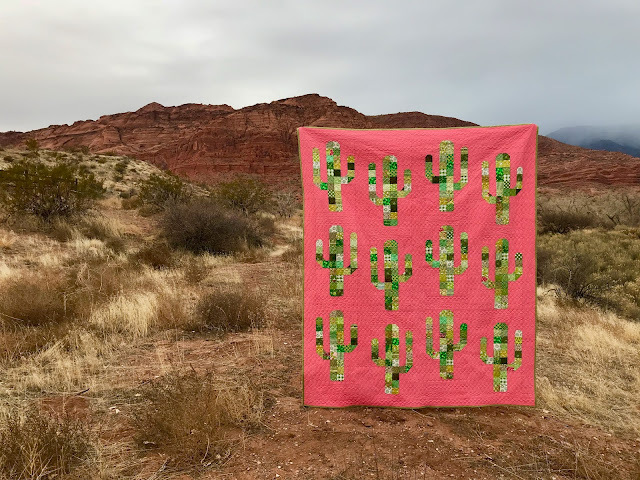 I actually had the idea for this cactus quilt rolling around in my head for several months before I put pencil to paper, and it was last October that I made my first block and posted it to Instagram. You can see more pictures of this quilt on my blog post HERE. These Saguaro blocks are a good way to make a dent in your green scraps. For more variety, I recommend swapping some 2.5" green squares with your friends! I'm SO grateful for my friends who donated their scraps when I made my quilt! Keep in mind that this isn't a quilt pattern...simply a tutorial, so you may have to do some figuring out on your own. But you're smart, so I'm sure it won't be a problem. 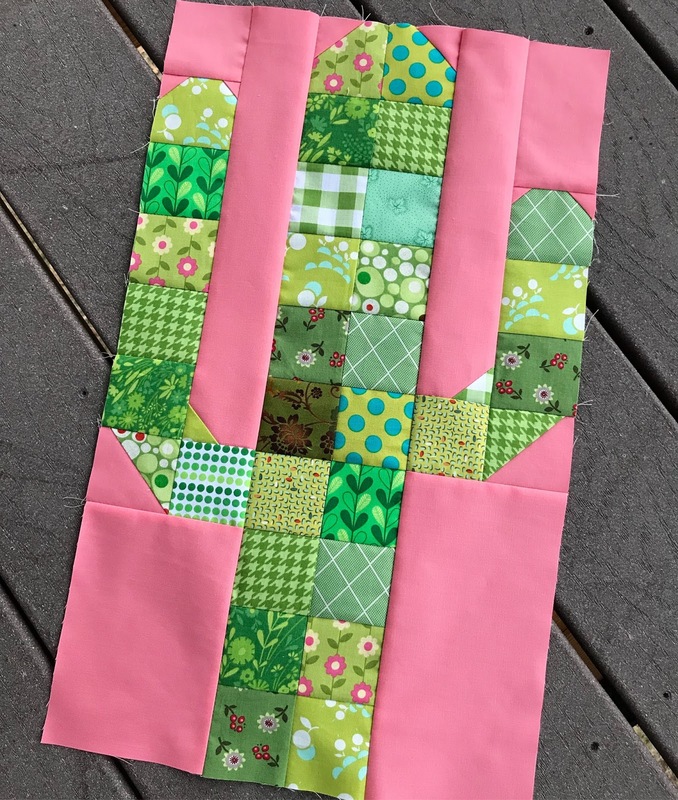 I will give you measurements assuming that your seam allowance is a perfect scant 1/4" and all of your blocks measure a perfect 12.5"x 20.5" (unfinished). Please measure your completed blocks before cutting your sashing and borders. You may need to adjust the lengths to fit. 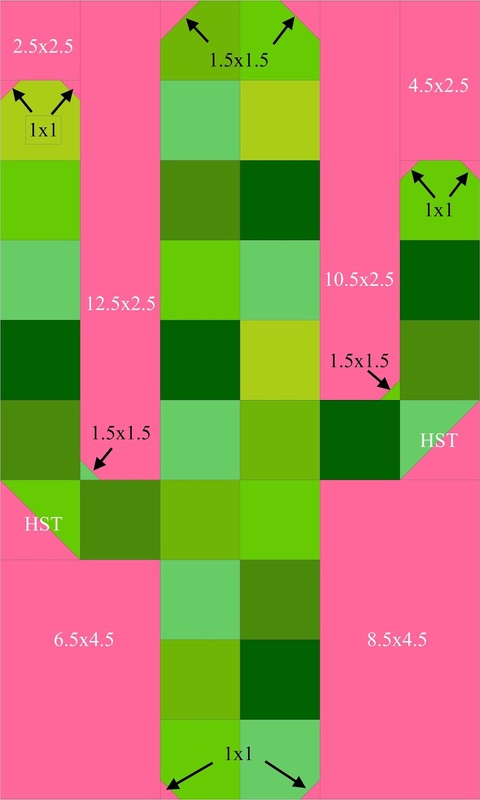 P/G HST = Pink and Green Half Square Triangles. Use your favorite method to make 24. 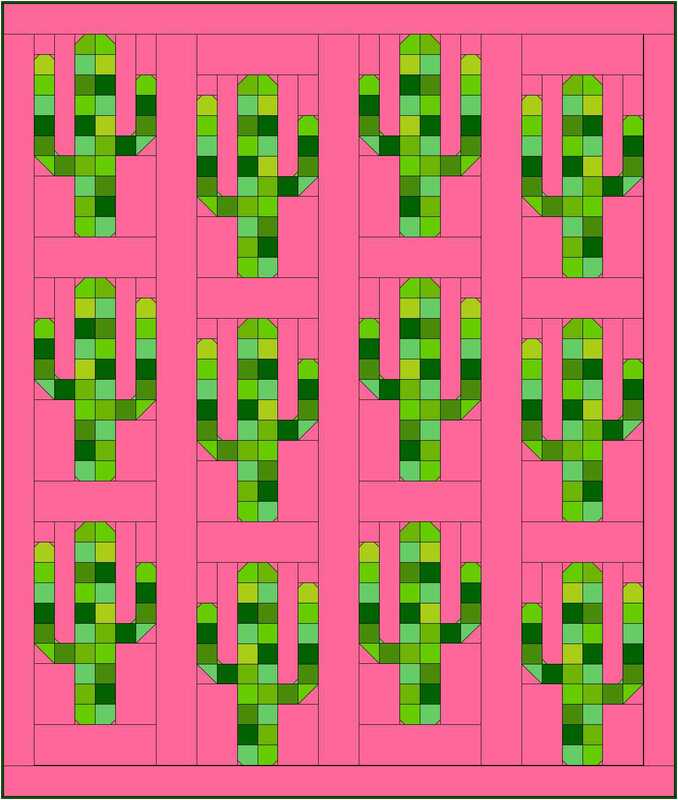 These cactus quilt blocks have ten "stitch and flip" corners. Placement is shown in the diagram (typed in BLACK) and photo below. Place the square on the corner of the fabric, right sides together. Stitch diagonally, press back to check for accuracy, then trim. The unfinished block measures 12.5" x 20.5". NOTE: You will need to make SEVEN blocks as diagrammed below, and FIVE that are opposite. You may notice that the 1' x 1" squares aren't added to the bottom of this saguaro. This was my prototype, so they were added later. Horizontal Sashing 12 12.5" x 4.5"
Vertical Sashing 3 72.5" x 4.5"
Side Borders 2 72.5" x 4.5"
Top and Bottom Borders 2 58.5" x 4.5"
Assemble the cactus quilt blocks as diagrammed below. 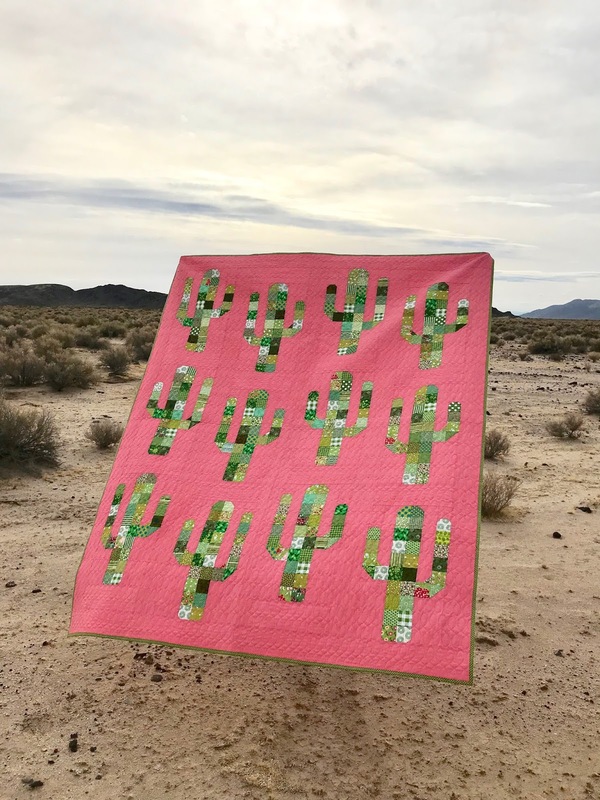 I'm so eager to see your Saguaro Quilts! Will you use a pink background or do you have another color in mind? Please use the following hashtags when you share your pictures on social media. Thank you so much for the tutorial. I had this idea to use an ombre fabric for the background. In my head, I'm able to make it look like a sunset (or sunrise) if I position the shades correctly. We'll see! Stunning! My daughter's already wanting me to make her one. And I like Rachel's idea with an ombre fabric too. Awesome pattern. Thank you for sharing it with us all! What a fun and beautiful quilt! 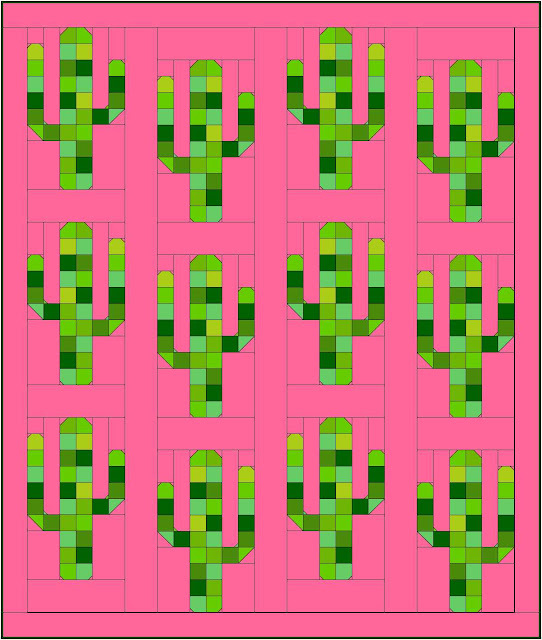 Just yesterday I was searching for a cactus inspired quilt project. This is it!! It's now on my list for this years projects. (I'll be hashtagging too) Thank you for the inspiration and the tutorial. So sweet of you to go through all that work for us. Wow, that looks great. Thank you for sharing the tutorial.